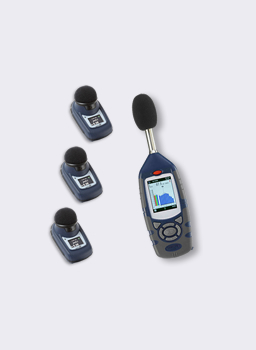 This hire kit includes three dBadge Noise Dosemeters along with a hand-held sound level meter. When a worker moves between different machinery or locations it can be difficult to make manual measurements. In some environments it would be difficult to follow the worker round making measurements. In these cases a noise dosemeter such as the dBadge is a better choice. Our combination kits offer the best of both worlds as they include three dosemeters along with a hand-held sound level meter. Both the dosemeters and sound level meter are of the correct grade and calibrated for noise at work measurements in line with the regulations. The dBadge dosemeters would be mounted on workers and left to monitor for the fill working shift. In this case three workers can be checked simultaneously. The sound level meter can then be used for spot checks, particularly where sound levels are expected to be high. In extreme cases the measurements from the meter can be used to check the suitability of the hearing protection that is available. The combination of hand-held meter and dosemeters make it ideal for mixed environments of very high and relatively low noise exposure, especially where workers move between different locations or machinery. The hand-held meter is used to make manual measurements at points of interest, particularly where noise levels are particularly high or where the dosemeters have indicated unexpected results, suggesting tampering or unusual noisy activity. The Sound Level Meter and the dBadge Noise Dosemeters are of the correct specification for a noise at work survey in line with the EU regulations - Physical Agents (Noise) Directive 2003/10/EC - and the UK HSE guidelines.